This is a collection of frequently asked questions for planning a national park driving/hotel vacation in southern Utah. This type of trip involves scenic drives through all 5 National Parks, along with low-to-moderate activity levels such as day-hikes ranging from 1-3 hours. Lodging consists of staying in hotels or motels and eating 1 or 2 meals per day in a restaurant. Since I get a lot of questions from folks who are planning their first trip into southern Utah, I thought it would be handy to compile a list of frequently asked questions to help others who are planning a visit. Please note that these are all my own person opinions. Although they are based on over 20 years of traveling around southern Utah, they may not apply to everyone. As a married man exploring southern Utah with his wife. So there you have it - I have multiple perspectives on southern Utah. If some of my ideas can help you plan your trip, that’s great! I thought I would start this out with the most common type of trip - a driving/hotel vacation in southern Utah. I will be adding more FAQ’s for camping and backcountry trips soon. All I need is the time to do it! What are the closest major airports to southern Utah? The vast majority of visitors to southern Utah fly into either Salt Lake City or Las Vegas. These are both major airports with a substantial number of carriers servicing them. Zion National Park is 3 hours from Las Vegas, and 5 hours from Salt Lake City. 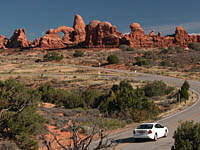 Arches National Park is 4 hours from Salt Lake City. These are the best places to rent a vehicle. Are all the National Parks in Utah accessible in a passenger car? Yes. All the National Parks have paved scenic drives that go to all of the viewpoints and trailheads. In fact, I usually recommend that a passenger car is all that is required for your first few visits. There are enough easily accessible trails and scenic drives to keep you busy for a very long time! I want to visit all 5 National Parks in Utah. How long do I need? If you want to visit all 5 National Parks I would allow at least 8 days. Note that this is a bare minimum, and more time would be a real asset. Trust me; you wouldn’t be bored out here with a few weeks! If you have less than 8 days available, consider just visiting a few parks. Nice sub-groups would be flying into Salt Lake City and visiting Arches & Canyonlands, or flying in Las Vegas and visiting Zion and Bryce. Remember that these parks are huge, so you will see a tremendous amount of scenery at each one. It’s better to focus on a couple of parks and really get to know them. What makes each park unique? Arches National Park - The world’s largest concentration of sandstone arches. You won’t see this many arches anywhere else in the world. Bryce Canyon National Park - Spectacular sandstone spires, called hoodoos, located deep in a natural sandstone amphitheater. The short trails to the bottom of the amphitheater transport you into a city of stone. Canyonlands National Park (Island in the Sky District) - The scenic drive traverses a mesa-top, located over 1,000 feet above the surrounding terrain. You are literally on an Island in the Sky, with views that encompass thousands of square miles of canyon country. The views up there rival those at the Grand Canyon. 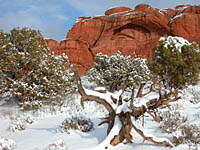 Canyonlands National Park (Needles District) - Backcountry paradise. This section of Canyonlands has a short scenic drive, but contains hundreds of miles of backcountry hiking trails. Capitol Reef National Park - An oasis in the desert. The Fremont River traverses the center of this park, resulting in a lush oasis complete with beautiful fruit orchards and abundant mule deer. The west section of the park contains beautiful red sandstone formations, and the eastern section consists of beautiful rounded cream colored sandstone domes. For variety of terrain, Capitol Reef is tops! Zion National Park - The Virgin River lies at the heart of this park. The scenic drive takes you along the river through a picturesque canyon with beautiful riverside habitat. A 16 mile section of river narrows begins at the end of the scenic drive. During the summer you can walk a mile or two into the narrows, or take an overnight trip to do the entire length. The eastern side of Zion consists of beautiful Navajo Sandstone formations, all visible from the paved red scenic road. If I will primarily be doing scenic drives and short day hikes, how long do I need to see each park? The bare minimum amount of time is as follows. Add at least another day to make it a relaxing trip. If you are only going to drive the scenic drives, you will only need one day for each park. You will, however, miss a lot of what these parks have to offer. What is a good city to stay in to see each park? Arches: Moab - A cool little town with a large selection of hotels & motels. Moab has one major grocery store and several small convenience stores. There is a great selection of restaurants, from fast food to gourmet. Downtown has lots of galleries and little shops, in addition to a large number of guides and outfitters. This is the only major town in Utah located on the Colorado River, so if you want to raft or canoe this is a great place to do it. Bryce: Bryce City - This isn’t really a town, but a collection of hotels, restaurants and shops on the entrance road to Bryce. It doesn’t have much character but its convenient location makes this a great choice. It is only minutes from the entrance of Bryce. There are a few large hotels and several fairly average restaurants. No fast food chains, but a few convenience shops. Canyonlands (Needles District): Monticello - A small and rather plain little town with an adequate number of hotels & motels. Monticello is located at 7,000 feet and is not surrounded by red rock. There is a small supermarket and several convenience stores, along with a few restaurants. This town shuts down pretty early so don’t plan on dinner at 9 pm! Capitol Reef: Torrey - A beautiful little town on the west side of Capitol Reef. It’s about a 5 minute drive to get into the park. Torrey has a good selection of hotels & motels. There are no major supermarkets, but there are a few small convenience stores. Limited fast food is available, but there is a nice selection of local restaurants. Torrey also has a few nice galleries and shops. 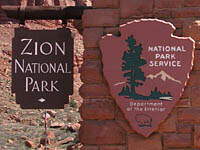 Zion: Springdale - An extremely picturesque little town right at the west entrance of the park. A good selection of hotels & motels. A very nice selection of restaurants, most with a local flavor. There are a few convenience stores and a lot of galleries and shops. Winters are a bit cold, spring and autumn are wonderful (75 - 85 degrees F), and summers are hot (85-100). Although it sounds like a cliché, it really is a dry heat. Our low humidity makes 90 degrees F seem perfectly comfortable. You will be amazed! Spring is a good time to see wildflowers (late April, early May), summer is great for the desert experience (I love it), autumn is a good time for foliage change, and winter is the perfect time for total solitude. Which parks are accessible in the winter? All of Utah’s National Parks are open year-round. 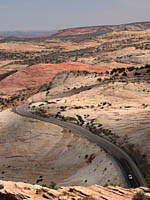 Generally, southern Utah gets very little snow so most roads are as accessible in the winter as they are in the summer. An occasional storm may dump and inch or two of snow, so you need to be cautious during those times. Bryce Canyon is an exception however. It is located at nearly 9,000 feet and receives a lot of snow. If you want to see Bryce you need to pay serious attention to the weather forecast during the winter. The temperatures will definitely be cold during December and January, with daily highs often staying in the 20’s or 30’s. Zion has a slight edge in winter and is usually 10 degrees warmer than any of the other parks. Are there any large cities in southern Utah? St George and Cedar City are the only large cities in southern Utah. St George is located about an hour’s drive from Zion National Park. These towns have all the conveniences of most major cities - department stores, shopping malls, large grocery stores, etc. If you need all of these conveniences, work one of them into your itinerary. Don’t stay in either one too long though, move on to the small towns in southern Utah because they are simply beautiful. All of the other towns in southern Utah are very small by anyone’s standards. Don’t expect department stores, shopping malls, or large supermarkets. Most towns have small convenience stores, a few hotels or motels, and locally owned restaurants. Don’t worry though, you will be able to find most of the essentials for your typical vacation at most of these towns. Just get used to picking up any supplies you need in very small stores & shops. Also, don’t be afraid of the locals. 95% of the folks that I bump into in rural Utah are the friendliest people in the world. Between the National Parks, are there long stretches of remote roads with no services available? Yes, so always gas up at the small towns even if you have half a tank of gas left in your vehicle. Probably the longest stretch is on I-70 between Green River and Salina - maybe 100 miles or so. More importantly for those of us with families, are there long stretches of highway with no rest stops? Not really. The state of Utah has done a fine job of providing restrooms and viewpoints along those long lonely stretches of highway. Do I have to worry about rattlesnakes and scorpions while hiking? Not really. These are extremely rare on all of the major trails in all of the parks. In my 20 years of hiking and camping, I’ve only encountered 3 rattlesnakes and 3 scorpions. Desert trails are actually great for avoiding critter encounters because, unlike forested areas, the trails are wide open. Of the few snakes that I have come across, I spotted them all when they were 30 or more feet away from me. I still, however, recommend using common sense when you are in the desert. Don’t reach under rock overhangs without looking first. Which Utah National Park is the least crowded? Southern Utah parks are all far less crowded than the “big name” National Parks such as Yosemite, Yellowstone, and the Grand Canyon. However, my perception is, from the most crowded to the least crowded, Zion - Bryce - Arches - Capitol Reef - Canyonlands. Not a good idea if you are visiting the National Parks. Although pets are allowed on the scenic drive and in most paved areas, they are not allowed on any of the trails. It is very dangerous to leave your pet in a vehicle, for even a short time, during the summer. Thank you for all this practical information as I contemplate my first visit to the southern Utah parks. Very interesting and helpful summaries. Good job! What is your opinion of adding Valley of the Gods and Natural Bridges or Antelope canyons to a trip? These are such wonderful tips with related photography of the place. Great blog. With everything in it. I would love to hear your suggested itinerary as "married guy travelling with young children". We want to go to Kanab and the Best Friend Sanctuary and would also like them to see the Grand Canyon, although not necessarily to stay there overnight - just to see the awe of seeing it for the first time. Any tips would be appreciated! These are essential relevant points you talk about that the National Parks Websites don't really explain. Thanks! will be going this Summer! 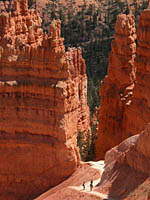 Utah is very popular place for visit. But take all the instruments for safety. Thank you for your nice sharing. You absolutely must visit Fisher Towers, which is about 25-minute drive from downtown Moab. It’s a hidden gem and great for those travelers looking to get away from the crowds.